We got the game Set for Christmas, and I’ve been meaning to post about it, because it’s a good one. Set is a strange game. We heard about it from my niece, whose math teacher would let the kids play it in class sometimes. Of course, that gives you the vague impression that it’s educational, and it feels weirdly educational. But not in a bad way. We’d have a whole group of us staring at the cards, and I’d swear I could feel wheels turning somewhere in my brain. New neural pathways developing. And then you look for a set. There are four different categories: color (purple, green, or red), shading (solid, half-shaded, or white), number, and shape (diamond, over, or squiggle). 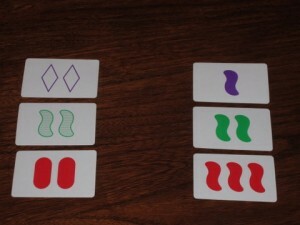 In order to create a set, you have to find three cards that are, for each of the four categories, all the same or all different. If you find a set before the other players, you collect those cards. There are at least two sets in the group above. Scroll down for the sets. It takes some time to get the hang of it, and frequently you’ll be sure you have a set until someone points out that you’ve got 2 out of 3 of something. In my limited experience, young kids often perform better than their elders. So it’s a nice equalizer. 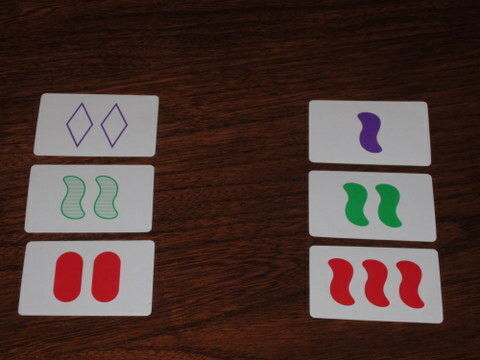 It can also be played as solitaire, and everyone plays simultaneously, so there’s no need to negotiate turns. All of this makes it fun. 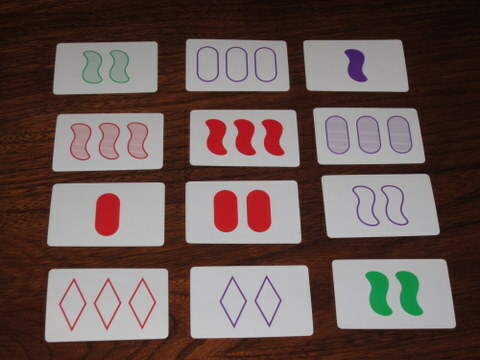 Yeah, spending time staring at cards until your brain hurts. It’s not fun. I can’t imagine making your kids do this. You are terrible parents if you buy this for your children. Doesn’t he so sound like someone who doesn’t have children yet? Gosh, weren’t we good at telling people how to parent back then? The review made me laugh and feel nostalgic all at the same time. The J update: She’s in misery. It’s 10:30 pm and she’s been lying in bed for two hours not sleeping because I thought that I’d get clever and try a medicine this afternoon that wouldn’t knock her out like Benadryl. She doesn’t look so bad, but she’s itching and I’ve already hit her with every cream and oral medicine that I can, so she’s out of luck. It’s definitely not insect bites or chicken pox, the doctor feels absolutely certain that it’s an allergic reaction to something and remains pretty firmly in the poison ivy camp. Interesting since Jennifer in my neighborhood’s been suffering the exact same symptoms. . . maybe there really was something floating in the air recently. Whatever. I want it gone. Doc says poison ivy stuff lasts a week. Ugh. Thanks for all the healthful wishes.